Another Poky Pizza Pedal is this Wednesday, and it looks like we’ll get some pleasant summery weather for our Bike Fun. The Poky Pizza Pedal will meet on Wednesday June 10 at 5:15 PM at Point Area Bicycle Service (1311 Strongs Ave between Main and Clark in downtown Stevens Point). As always, the Poky Pizza Pedal is free of charge, no signups are necessary, and all Poky Pedalers are welcome. If you need a shot of air before we ride, step into PABS and kindly ask John, the resident bicycle guru, if he might pump your tires up. He has always been happy to oblige at no charge (thanks, John). From there, our gathering of Poky Pedalers will set off on a 4-mile scenic urban bike ride on calm streets and non-motorized paths. We typically ride at about 6-8 MPH. If you have never been on a Poky Pedal, or if you are wondering about allowing your children to ride their own bikes, you can read more on the Are Poky Pedals Family Friendly? webpage. Our loop will return us to a pizza place within a block or two of our starting location. 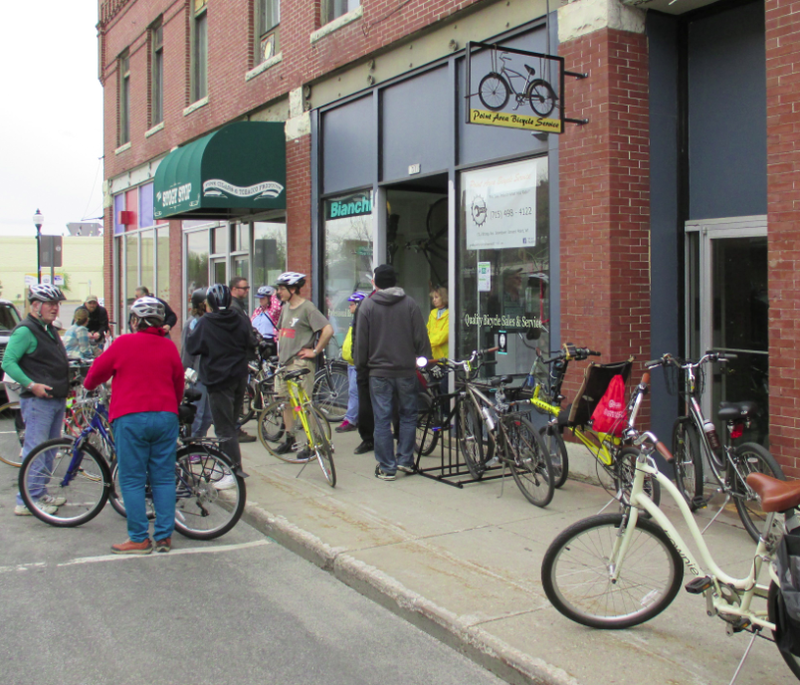 We’ll extend our Bike Fun by sharing food, drink, and the company of Poky Pedalers. Please plan on purchasing whatever you consume. Cash is most convenient if you wish to share in a group pizza order. For more information about the monthly Poky Pizza Pedals, you can click here to learn what to expect. The forecast calls for sunshine and 80 degrees. If you’ve been spending all spring wondering when we’re gonna get a really nice day for bike riding, Wednesday’s Poky Pizza Pedal is just the ticket. So dust off that bike and come share Bike Fun with us. Bicycles, pizza, and sunshine make for a splendid late-day diversion. This month’s Poky Pizza Pedal is just the thing to inspire Poky Pedalers to hop on their bicycles and let Bike Fun be their guide. See you Wednesday.